Of the many quality salmon pools on the middle River Tay the Gauge Tree on Dunkeld House has to one of the most beautiful and tactically positioned 'stoppers' for running salmon at the upstream end of several hundred yards of faster streamy water. This beautiful Dunkeld House salmon beat pool to my mind represents a quality 100 yards of perfect fly water for those who have mastered the Spey cast with precision anchor point placement ability. The Tay runs deeper down this highly scenic left hand bank in medium to low water levels which encourages salmon to run up this left bank and stop on arrival here in the Gauge Tree pool's slower flow. I've been involved in the capture of 2 simultaneous 'Springers' from the riverbank at once while fishing with a colleague in this pool however if a pod of fresh run 'sea licers' come snooping up through the downstream Cathedral Stream and pause in the main Gauge Tree Pool salmon lie then a blind dog in a snow storm could score here! From my own personal experience in the 'Gauge Tree Pool' salmon often lie within 2 to 10 yards of the riverbank so a long line is not really required. The problem psychologically on the Tay for many salmon fishers is that they are put off by the typical 80 to 100 yard width of the river making them focus only on distance and not the more important and effective topic of 'fly control'. The entire salmon fishing tackle industry is mainly geared for 'distance of fly' and not 'control of fly' which means the short range salmon lies are rarely taken seriously or targeted effectively enough. The lower half of the 'Gauge Tree Pool' on the Dunkeld House Beat is a 'fly only' pool which is the most effective way to cover its main salmon lies. To swing a Toby 'Salmo' or Vision Oneten through this pool would be the same as smothering a Black Angus fillet steak with HP sauce! The Dunkeld House beat is fortunate to benefit from both high quality spinning water and fly water so keeping both apart is currently part of the daily fishing operation. Whether it makes a difference to a salmon or not 'the jury is out' but it is the 'kiss of death' for most dedicated fly fishers if they're allocated a pool to fish that has already been bombarded with spinners that morning. The recent 'catch stats' & fishing reports from the 2018 salmon fishing season (which was logically due to the hot weather and exceptionally low warm water this year) could almost make you feel like calling the Samaritans! 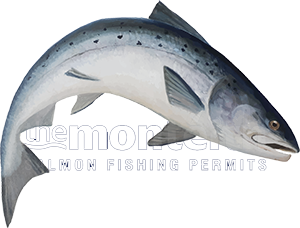 In saying that you can bet your bottom dollar there will yet again be perfect Spring salmon in the Tay over the next 3 months even if few anglers are out 'effectively' searching for them. One of the main reasons April & May always looks better on paper is because the daily rod pressure increases. The reality on the Tay during the early Spring months of the season is that the ghillies are accounting for many of the salmon landed while out covering their beats by boat (if they are keen enough) when no or few fishing guests are present.